Getting the No. 1 overall pick would certainly be better than getting the No. 2, 3 or 4 pick if you’re the Wolves. There is your breaking news bulletin for the day. 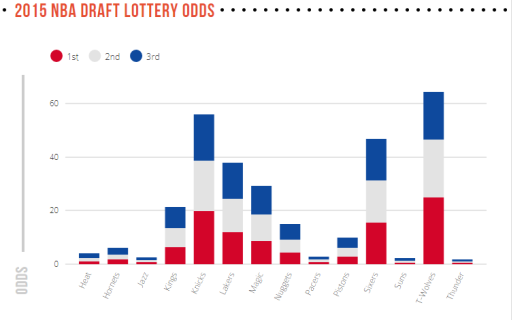 But what are the odds of the Wolves getting the top pick when the order is determined tonight? 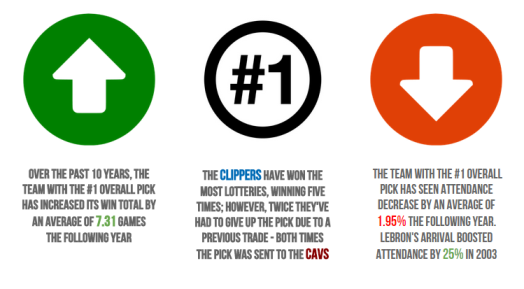 How has the top pick fared historically? 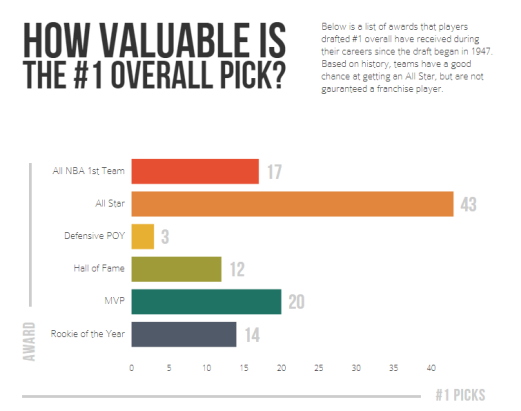 And how does the top pick impact a team in his first year in the NBA? There’s nothing earth-shattering in that graphic above, but it is a helpful visualization when realizing that while the Wolves odds of getting a top-3 pick (and the No. 1 pick) are better than any other team, the difference between Minnesota and New York (second-best odds) isn’t all that great. The fact remains that the most likely individual scenario is that the Wolves get the No. 4 pick. How good could we expect the No. 1 pick to be? Well, that chart above gives a pretty good overview of how the 68 previous No. 1 picks have fared since the draft’s inception in 1947. Roughly two-thirds of them at least become All-Stars. Fourteen won Rookie of the Year (including Andrew Wiggins this past season).To be an All-Star at least once means you are at least a pretty good NBA player … so the bar for No. 1 picks is, I suppose, usually they are at least pretty good. Interestingly, the No. 1 pick (on average) means a nice boost in wins (though that certainly didn’t happen with the Wolves last year, who dropped from 40 to 16 wins). What is more interesting, perhaps, is that attendance actually drops for the team with the No. 1 pick … so the Wolves, if they get the pick, shouldn’t assume it will mean a boost at the gate.